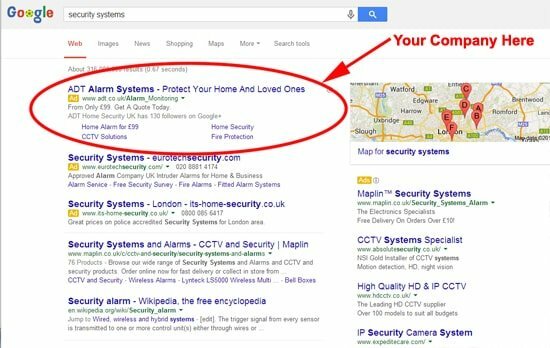 You are here: Home / Security Firms AdWords Offer! When people look for a security firm a lot of the time they turn to the internet and in particular Google. Every month Google processes 33,100 searches for the phrase ‘security systems’. Another phrase is ‘security guards’ which gets a whopping 5,400 searches a month. So every single month people are searching for your services. We are Google Partners and have access to a tool that enables us to research what phrases are being searched for. The image below shows the results of searches relating to the security industry. This shows us that people are looking for your services and we can help them find you. This is by far the most cost effective, targeted advertising being used today. Get ahead of your competitors and start earning revenue today. In terms of the online search market, Google has around 84% of the UK share. Each day there are an amazing 5,922,000,000 searches on Google! The days when people used to look in the yellow pages or another directory have gone. People in need of a security firm will do their research online and then take action by emailing or calling you. Let us make sure that they find you. We, at Trafiki are qualified Google Partners which means we are able to offer you £150 worth of free Google AdWords vouchers to any new client’s account that uses our services. We can help you generate new business at a price that you can afford. Call us today for more details on our security firm offer. With our help your company could appear here.